FRANCES DENSMORE'S OPEN MIND toward American Indians (at least for her day) may have had something to do with her father's experiences during five years in the Union army. 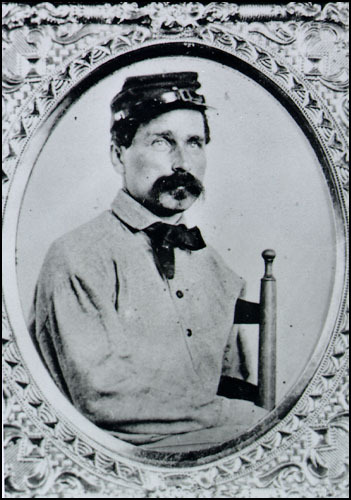 Benjamin Densmore volunteered to command black soldiers, an unusual act given the pervasive racism among white Northerners. Densmore served as a quartermaster's clerk in Tennessee. He was taken prisoner-of-war on July 13, 1862 when his regimental commander surrendered the 3rd Minnesota to legendary Confederate fighter Nathan Bedford Forrest. Two days later Densmore and the other enlisted men were paroled. To some men of the 3rd it was a humiliating affair, but Densmore's surviving letters barely mention it. Later that summer, Ben Densmore found himself back in Minnesota fighting Dakota Sioux Indians. The 3rd Minnesota marched across the state looking for a fight. But they also had to eat. On September 23, some of the men were off digging potatoes at a place called Wood Lake when they were ambushed by a Dakota war party. In the ensuing battle, Densmore was struck in either the back of the head or neck by a musket ball - reportedly Indian fire - and knocked unconscious. Also in the summer of 1862, Benjamin Densmore's younger brother Daniel, a 27-year-old law student, joined with friends to form their own company of Union volunteers. The brothers began a richly detailed correspondence about their separate-but-parallel military careers. Both men sought - and received - an officer's commission in the newly formed Bureau of Colored Troops. Under a recent order from President Lincoln, freed slaves were viewed as war contraband. In Columbus, Kentucky, Benjamin Densmore helped organize former black slaves into a new company of Union soldiers. Benjamin Densmore wrote to his brother: "The work necessary to fit such troops as these for any kind of military duty is far heavier than with the American troops." 3 Nevertheless, both men stayed with their regiments through the end of the war. Ambition was at least part of the brothers' motive for volunteering to fight with black soldiers. They may have been able to rise higher and faster in the colored troops than through conventional ranks. It wasn't the kind of command that most aspiring white officers would seek - racial prejudice was too strong . Daniel Densmore complained bitterly about the treasonous rebels and the Union's sluggish response. In a scathing letter to Benjamin about the possibility of their army service dragging on indefinitely, Daniel accused President Lincoln of being too soft on the South. 1. Benjamin Densmore compiled service record, National Archives and Records Administration, Washington. 2. C.C. Andrews, "Narrative of the Third Regiment" in Minnesota in the Civil and Indian Wars 1861-65, (Washington: U.S. Government, 186-?) 147-197; Daniel Densmore family genealogy, Benjamin Densmore Papers, Minnesota Historical Society; C.C Andrews to Gen. L. Thomas, 20 July, 1863, in Minnesota in the Civil and Indian Wars (St. Paul: State of Minnesota, 1890) 243-249. 3. BD to DD, 3 November 1863, Densmore papers (all letters cited are from this collection). 4. Glatthaar, Joseph T. Forged in Battle : the Civil War Alliance of Black Soldiers and White Officers (New York, Free Press, 1990) 35-59, 169-206; Benjamin and Daniel Densmore compiled service records, National Archives. 5. Ben Densmore compiled service record; DD to BD, 13 December 1863; BD to DD 18 June, 1864. 6. OD to BD, 30 December 1863. 7. Orrin Densmore Sr. was most certainly a member of the Republican Party. After the war, he served in the Minnesota State Legislature and was once nominated for speaker of the Republican-controlled House of Representatives (Red Wing Republican, 23 December 1869). 8. DD to BD, 1 November 1863. 10. DD to OD, 2 June 1864.